Life expectancy is down again due to opioids. We’re not really doing much of anything to solve this problem. 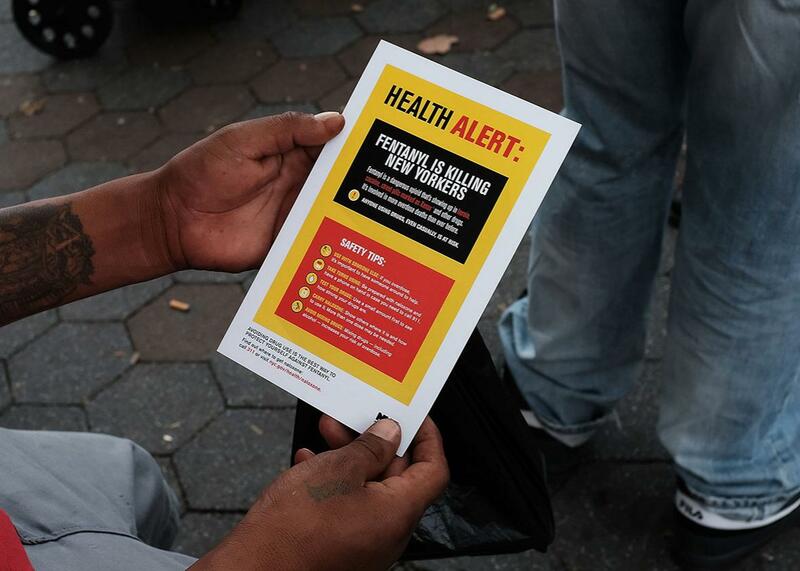 A heroin user reads an alert on fentanyl before being interviewed as part of a project to compile data about overdoses on Aug. 8 in New York City. America is one of the wealthiest countries on the planet, and for the second year in a row, our life expectancy has dropped. The drop was small—just 1.2 months, the same as last year’s—and in the context of the past several decades, appears as more of a stall on an otherwise steadily growing trend line. What’s the cause? A new report by the Centers for Disease Control and Prevention’s National Center for Health Statistics pins the blame on the unrelenting rise in opioid overdoses. Fatal drug overdoses spiked to more than 63,000 in 2016, up from 52,400 in 2015. The vast majority of overdoses—42,200 of them, or 120 a day—are opioid-related. The most alarming jump, and nearly all of the increase, came from a doubling in the category of synthetic opioids, largely driven by illicitly manufactured fentanyl, said to be 50 times more potent than heroin. If you’re east of the Mississippi, it’s increasingly hard to find heroin that isn’t contaminated with fentanyl. Overall though, we’re not doing nearly enough to combat the opioid crisis. The president, for example, would like to solve it by simply getting more people to say no to drugs. In reality, it requires much more robust and complex solutions. On the harm-reduction side, America still has zero operational safe consumption sites, which provide a sterile and medically supervised space for drug users to inject their drugs. (No one has ever died inside one of these spaces, which do exist outside of the U.S.) Naloxone, the only antidote that reverses opioid overdoses, is priced out of reach for many communities to widely distribute it. Local communities are fighting tooth-and-nail to distribute sterile syringes, a public health intervention proven to reduce the transmission of HIV, Hepatitis C, and other bloodborne diseases. We’re also failing to provide better treatment for people struggling with addiction. When Trump declared the opioid epidemic a public health emergency, he freed up a measly $57,000 in funds—less than $1 per fatal overdose victim. Medication treatments like buprenorphine and methadone—the only FDA-approved drugs proven to cut the risk of fatal overdoses by more than half—remain unused by the majority of addiction treatment providers. Meanwhile, Republicans are doing their utmost to roll back health care and undermine access to mental health care treatment, an important piece of the puzzle for opioid users. The decrease in lifespan may be the result of one specific, vulnerable slice of the population dying far too young. But it is all of our concern, and right now we are falling down on the job.